Never leave the Thermapen inside an oven, grill, smoker, or microwave while cooking. Do not leave it under heat lamps or on a hot surface like a grill hood. When checking temperatures above a grill or fire, be careful that the Thermapen body does not get too hot. can cause internal damage to the probe. Also, use care closing the Thermapen when the probe has been inserted into a hot food or liquid. The probe is metal and may be very hot to the touch. Allow it to cool before closing. 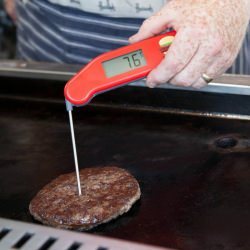 If you are likely to be using the Thermapen in high-heat environments, you may want to consider purchasing a Silicone Boot. Silicone offers short-term protection from radiant or contact heat. It will also cushion the Thermapen from knocks and drops - even a drop to concrete. The boot fits snugly and is easy to remove for cleaning. 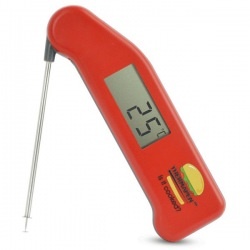 The Thermapen is very fast, so you can quickly measure temperatures and then move out of the hot zone. If the heat is too high for your hand, without a protective mitt, it is probably too hot for the Thermapen body. The Thermapen is splash-proof and will resist exposure to wet hands and splashes from cooking liquids, but the housing of your Thermapen should never be submerged in water or any other liquid. Do NOT put your Thermapen in the dishwasher. Again, we recommend using ETI Probe Wipes available here or an antibacterial cleaner on a paper towel. The Thermapen features a smooth, almost seamless design with very few cracks or crevices where food can get caught and spoil and is very easy to wipe clean. Take special care to fully clean the rotating hub at the top of the Thermapen housing and the probe retention groove at the bottom. These can be cleaned with the edge of a rag or wipe. As a general rule, try to avoid getting moisture, flour, or oil on the rotating hub. Although there is an O-ring seal inside the hub, oils and fine powders can work their way past the seal over time and accumulate in the housing, causing problems with the electrical components. Each time meat is tested that is not fully cooked, the Thermapen probe may be exposed to harmful bacteria. Wipe the Thermapen probe clean every time it is exposed to uncooked meat - particularly before probing cooked food that is ready to eat. 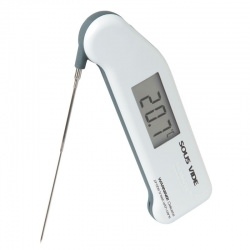 The same precautions that you use with a knife or a cutting board apply to a thermometer probe.to a thermometer probe. Any non-tainting, anti-bacterial wipe or spray cleaner and paper towels can effectively sanitise the Thermapen probe tip. You can also purchase Antibacterial Probe Wipes here. The Thermapen probe and body should also be wiped clean after each cooking session and before you put it away.